Womb Chair Review - The Ultimate Piece in Modern Comfort! Design Within Reach (DWR) have been operating for almost 20 years and in that time have had a big impact on the fashion of furniture. They believe in making authentic modern design accessible to all. In this Womb Chair review guide you will learn all about the origin of these types of chairs, their quality, the styles available, and their warranty information. To achieve this they’ve sourced designers and experts and brought together some truly unique designs that aren’t available elsewhere. Style, utility and comfort are the main themes behind their ranges. DWR have a large collection of innovative products which are some of the most fashionable around. DWR are a high end furniture manufacturer, making some of the most stylish and recognisable pieces around. A lot of the cheaper brands consist of knock off DWR furniture, but if you want the real deal you go to the source. The womb chair is one of their most popular pieces, let’s take a closer look at it. 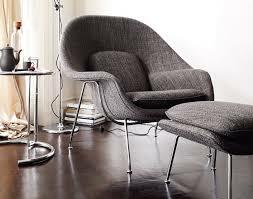 The Womb Chair was created back in 1946 by Finnish designer Eero Saarinen. 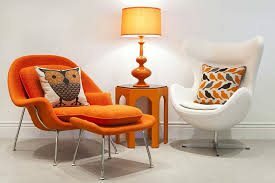 It represented mid century modernism and is now an iconic design which is known worldwide. The womb chair was designed to perfectly support relaxed sitting. Despite the older design it remains one of the most comfortable models around, providing comfort and support for the user. If you are interested in another extremely comfortable chair with an modern looking design, I suggest you take a look at our Eames Lounge chair review! Made with foam over a fibreglass shell it has a number of design options to customise it for your home. 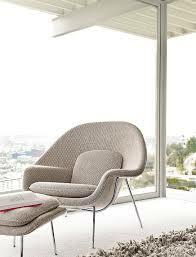 The original Knoll design is sold by DWR which ensures the best specifications and product. There are a number of cheaper “knock-off” products available more cheaply but generally they are to be avoided. They offer a worse design and even though they are cheaper they are less value in the long run. The womb chair is customisable to fit your particular tastes and needs. Firstly you’ll be able to select between fabric and leather. Leather is more durable and gives a timeless look, but isn’t for everyone and can often be more expensive. Fabric is more affordable and can give a more relaxed look to your chair and room. For the fabric you can customise the colour of your womb chair. Choices range from fire red all the way to ivory so you should be able to find exactly what you’re looking for. You can even request swatches of the fabric so you’ll be able to see the colour and feel the material before purchase. Finally you can customise the colouring of the iconic frame which makes the womb chair. Available in black or chrome it allows for a more traditional or stand out modern look. The colour of your frame should match or compliment the fabric or leather in order to give the cleanest look. 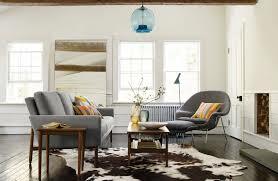 DWR offer a matching ottoman to complete the womb chair. This leg rest means even more relaxing comfort in the home and comes in matching fabrics and colouring. The womb chair itself has a unique design that is immediately an asset to your home. The style and design choices allow you to really explore the options and get the perfect chair for your home. DWR are known for their quality across the board. They have some of the best experts in the field working on their products which ensures reliability across the board. The materials they use are some of the best available, with durable fabrics and leathers added to quality construction. DWR seem like one of the most reliable manufacturers out there and that’s exactly what you look for when you’re about to spend a lot on luxury furniture. A one year warranty is offered on all DWR products. This covers workmanship and material defects but it’s always worth double checking before purchase exactly what’s covered. The womb chair itself is known to be one of the best products around. The design is kept closely by Knoll and there is no outsourcing, meaning more reliable and consistent construction values. “At this furniture store I feel like a kid in a candy store. I go around and drool over all their stuff, it’s all so nice. The furniture is all high end designer. The furniture you see knock offs of elsewhere. It is decidedly modern. 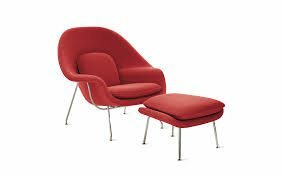 Though some of the pieces have become classics.” - Omar G.
When it comes to the womb chair people just seem less pleased about the cost. 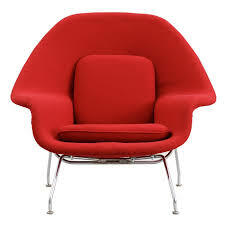 The price has been inflated because the design is only used by Knoll. This means it’s difficult to get a womb chair, and basically impossible on a budget. There are alternatives out there but it won’t be what you’re expecting and generally the quality is lacking. There are sometimes deals available on online retailers but if you’re looking for a proper womb chair you will most likely have to save up rather than taking a short cut. Overall feedback about DWR and the womb chair is positive and they’re showing the quality in this manufacturing process. If you are interested in another lounge type chair that you can trust the quality in, then I would suggest you take a look at our barcalounger page! The womb chair is one of the most recognisable pieces of furniture in the world. The iconic and unique design make it a really great choice for you. The personalisation in the design choices allows you to make it perfect for you, with over 30 different colour to match your personality. The womb chair’s design goes beyond style but is actually made with the user in mind. It’s specially made to give relaxed support that other chairs don’t provide, making it practical. The womb chair combines comfort and style is an impressive way. More than just another piece for the living room it’s striking and memorable. Perfect for anyone who appreciate the style of furniture and are conscious of the entire look and feel of a room. I would like to warn you though, it's very easy to fall asleep in this chair! The price for the womb chair can be limiting for a lot of people. The justification for it is that it’s aimed at being more of an icon than just a chair. The womb chair can be an asset to any room and desirable if you’re looking to change up your living room. One of the more expensive units on the market, but perfect for those who want to get more from their furniture. If you’re considering a womb chair, you would do well to wait and get the proper thing, rather than a cheap alternative. I've found that the cheaper knockoffs don't have as much back support as the original, which is half the reason it's so comfortable. Ultimately the womb chair is not for those who just want a chair. It’s for those who want furniture that is cutting edge fashion and for those who want their furniture to say something about their personality. A great investment for style and comfort.